The Commonwealth Nations’ Remembrance Day, held Nov. 11, reminds citizens of the U.K., Canada and other nations recognize the members of their armed forces who have died in the line of duty. This year, General Motors’ British arm Vauxhall celebrated with a commemorative photo shoot of its D-Type Army Staff Car alongside the 2015 Corsa. The D-Type Staff Car was saved from a London Scrap yard in 1946 and was then restored to its original condition. Today it resides at Vauxhall’s headquarters in Luton, Bedforshire, UK. 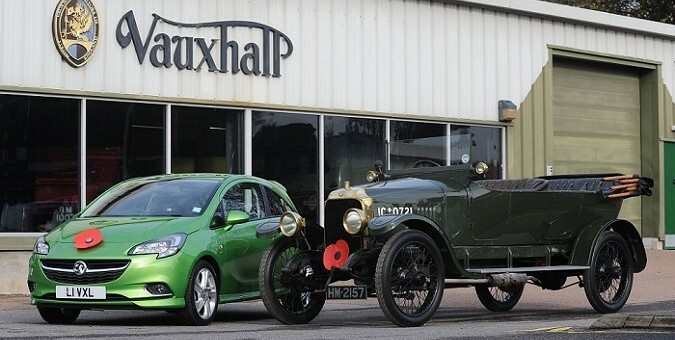 The car is one of the oldest Vauxhall’s in existence, and is pictured here alongside the newest addition to the British brand’s lineup.